El Dorado Seaside Suites is one of the All Inclusive Resorts that is specially designed for romantic escapades, honeymoons, weddings and anniversary vacations. Upon arriving at your hotel, you will be greeted with a Bievenido(this means Welcome) and a glass of sparkling wine. What makes Seaside Suites special? This hotel is special because of it's majestic tropical atmosphere surrounded by magnificant Caribbean views. It is made for couples and your surroundings make it an oasis for love. As pictured below, hammocks are located in various places throughout the resort for couples to relax together under the shady palm trees. Latin Fusion, Mexican, Italian, and Asian. As well as 24 hour room service. There are 7 tropical bars including top shelf alcohol and the famous swing bar! 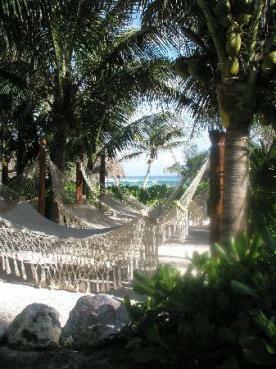 This Riviera Maya Resort offers 3 freshwater, clear swimming pools and swim up suites. Swim up suites are where you step out of your terrace into the swimming pool! The beach is beautiful at Seaside Suites. The endless white sand beach is breathtaking! You have your option of several different suites. Garden View, Oceanview, Oceanfront, Swim Up, and the Premium Suite. All the suites have romantic 4 post beds, in room jacuzzi, a/c and ceiling fan. Marble or mexican tile floor, tv, dvd player, minibar, coffee maker, hair dryer, safety deposit box, iron, ironing board and terrace with hammock & chairs. fresh flower arrangement, bottle of wine and fresh fruit daily. That is worth it if you have a very special occasion! While you are at this resort, spend some time in the Spa! They have great services such as massages, facials and body treatments. 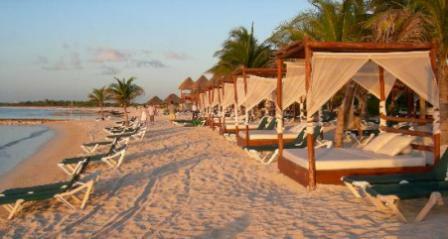 This resort is a sister resort to El Dorado Royale. Check it out as well if you like Seaside.